The Mark VII was the one of largest tanks produced by Britain during World War I. Only three of the tanks were ever built, but despite its rarity, the Mark VII gained a level of renown after a replica of the tank was used in the 1989 movie, Indiana Jones and the Last Crusade. The armament of the real life Mark VII included two side turrets with 6-pounder guns as well as seven machine guns. The movie version of the tank had an added rotating gun turret on top which was not typical. 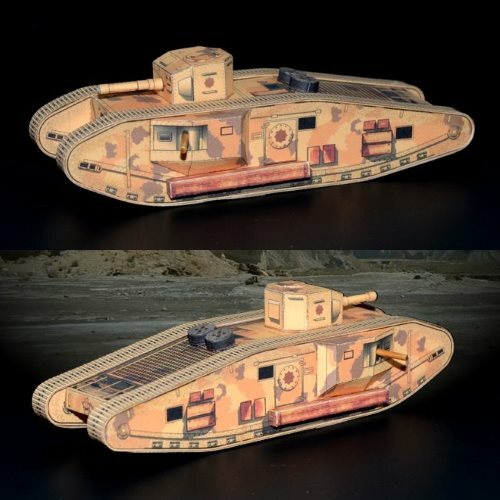 Pictured is a paper model of the Last Crusade tank designed by Dave Winfield. The printable template for the model may be downloaded here. The He-Man animated television series ran in the US from 1983 to 1985. I don't remember watching the cartoon, but I do remember the 1987 live action movie featuring Dolph Lundgren in the title role. Since the 80's the franchise has achieved cult status. 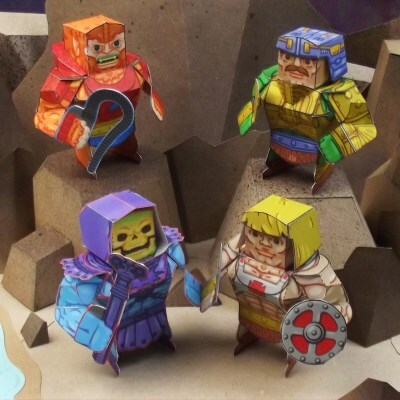 Pictured are a selection of the seven He-Man paper toys offered by Folduptoys. From upper left going clockwise, there is Beast-Man, Mat-At-Arms, He-Man and Skeletor. Also available are Stratos, Trap Jaw and Zodac. All seven toys may be downloaded here. The He-Man franchise began as a collection of action figures produced by Mattel. The animated series featuring the characters was produced after the toy line became popular. Harley Quinn is one of several DC Comics bad guys to appear in the 2016 movie, Suicide Squad. 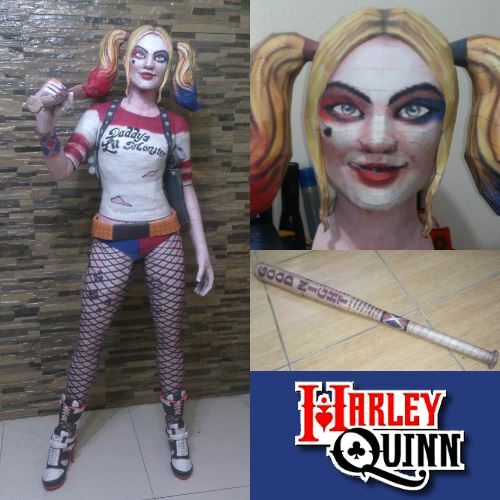 This life size paper model of Harley in her Suicide Squad garb was originally created by Unfold Brazil to be 19.7" (50 cm) tall. Desiring something a little taller, DeviantART member Kirob3rus modified UB's papercraft template to produce a finished model that stands 5' 8" (1.73 M) tall! Kirob3rus' Pepakura PDO template for the model may be downloaded here. Harley Quinn's first appearance in the DC Comics Universe was not in a comic book but as the Joker's sidekick in a 1992 episode of Batman: The Animated Series. The Empire Strikes Back contains one of the most memorable scenes of any Star Wars movie: The Battle of Hoth. Who can forget the epic fight between the Imperial walkers and the Rebel Alliance snowspeeders? 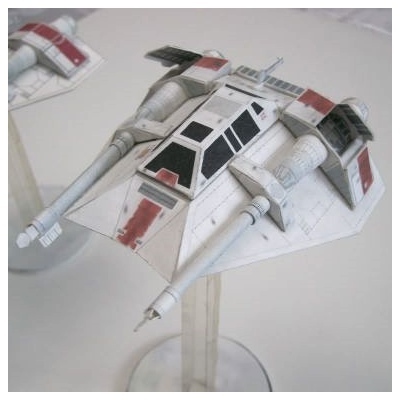 Pictured is one of the better snowspeeder paper models I have come across over the years. It was designed by Sean Kelly at TCF Gaming. Sean's website is no longer active, but a download of the template for this model is still available here. The completed model is roughly 1:48 scale. 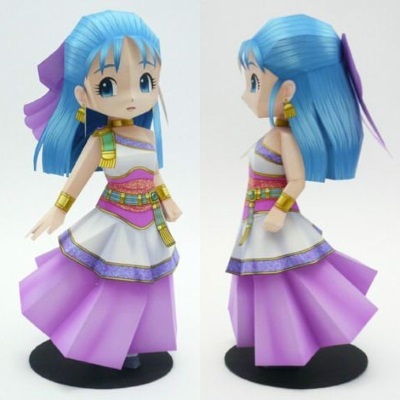 Here is a lovely paper model of Nera Briscoletti from the Dragon Quest V video game by Square Enix. In the game, the characters are 2D pixelated sprites. So this papercraft represents the creator's vision of what the character would look like in 3D, anime style. The PDF template and instructions may be downloaded here. Look for the links on the left side of the page. In the Japanese version of the game Nera is named "Flora".